Armed with maggots and a new spool of 2lb breaking strain line I set off today to catch some roach. I wanted to fish light. 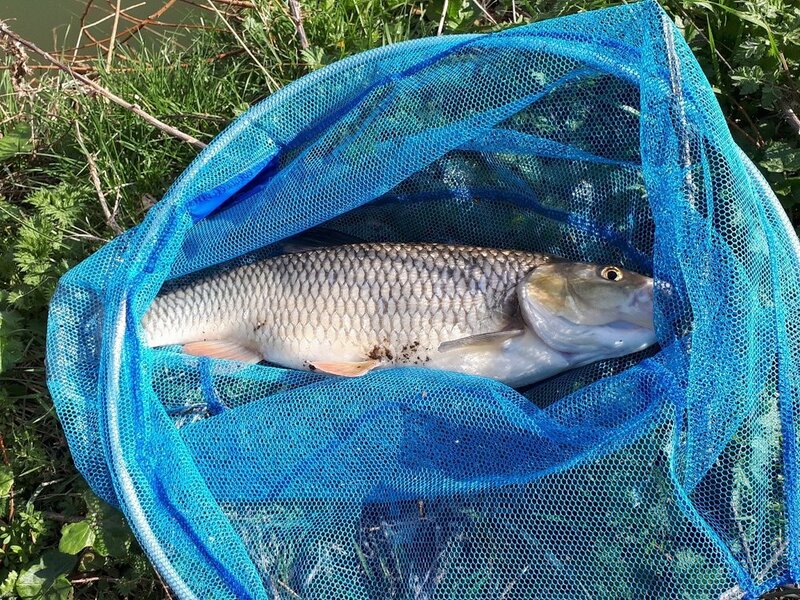 I did catch some roach eventually but this 2lb Chub was the first fish landed. It put up quite a fight on such light tackle. you cannot beat a bit of light tackle, I use for spinning for pike and perch well done. Brilliant, well done. Thanks for posting I might have a wander down the canal in the sun. pardon my ignorance, but isn't the course fishing season ended? Yes you are right for rivers, some canals and some still waters. Other still waters may have no close season. Never really been into fresh water fishing ,but it do look like a nice fish and a good day of weather you had as well . The place we went for the stalking had a fishing pond in the middle and every night there were folks with their bivvys up and fished through the night.Vey busy place right enough. Commercial fisheries can make up their own minds about closed season. Very few actually have one (for commercial reasons) but there is still a lot of debate about whether fishing during a closed season has much impact.